Main entrance, Metairie Race Course, 1869; top image, Metairie Race Course, ca. 1850's. transformation came about because of some good, old-fashioned payback. 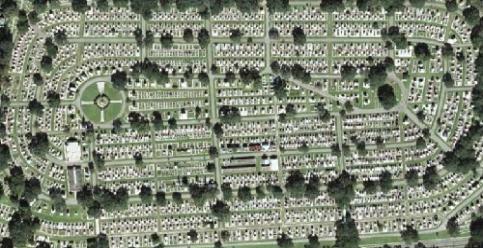 the story goes, Howard swore that he would see the Metairie Race Course turned into a cemetery. Cemetery, where, one could say, he has been granted permanent and irrevocable membership. Lexington and Lecompte, and after that, a library would be needed to contain it. their rival chefs and rival cellars. And, after that, again, the grand salons of the old St. Louis and St.
Charles, filled with everybody, and all enjoying themselves. That was what horse-racing meant then. belles and its horses - they are expiating their sins, too, in cemeterial ways." 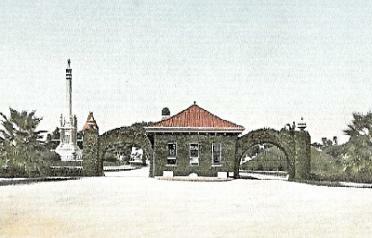 until 1953, when it was demolished to make way for the Metairie Road overpass. 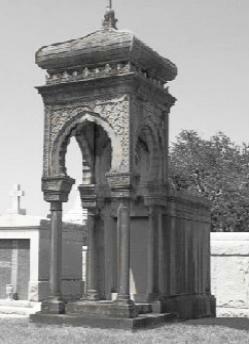 most prestigious cemetery in the city, covering 150 park-like acres, with more than 7,000 graves. 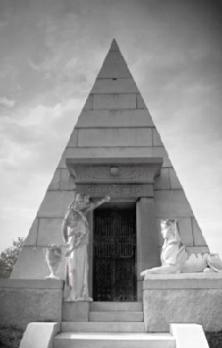 Forbes.com as one of the ten best cemeteries in the country.